Today I'm going to feature the CottageCutz Sunflower which is absolutely perfect for summer cards and layouts. 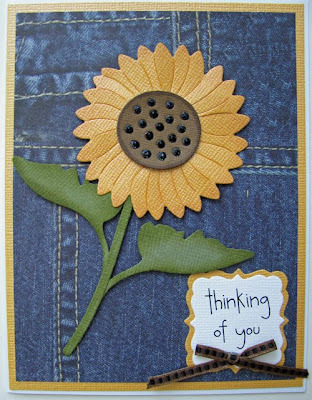 When I think of sunflowers I think of the of the lazy days of summer and denim overalls so I decided to use this denim patterned paper to give this card a casual, relaxed feel. I cut my pieces from Bazzill and American Crafts cardstock, inked the edges of the flower and leaves and used my black Copic marker to color the dots on the inside of the flower and then applied some Stickles. 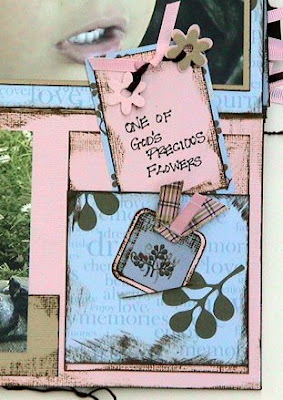 I also used the Quickutz Label 2x2 die for my sentiment block. Be sure to check out all the wonderful Summertime CottageCutz dies for all your summer projects. world. They are joy for today and hope for the future! have seen them on layouts and have drooled over them on eBay! but I never mind doing that if I am happy with the results! 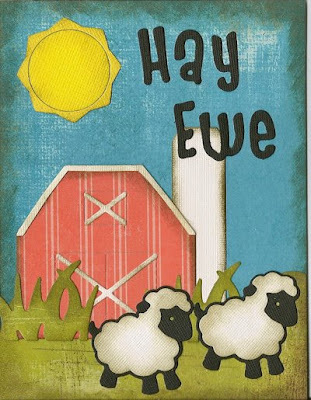 I created this funny little hello card using the new QK Rev Barn die from the June Quickutz Release. I decided to add a bit of trim to the top of my barn so since I had cut the barn out twice already (once in the red stripe and once in the white), I just took the white piece of barn and trimmed the edge off the top to add to the red barn. I also used the QK 12" cloud border, 2x2 grass, 2x2 sheep (here is cute sheep that is very similar from Sizzix), and the sun is from the Sunshine Gift Set. I picked Chick a dee for the sentiment because it is such a fun and whimsical little alpha I thought it would be a great touch to this card. The inking was done with Tim Holtz distress inks. 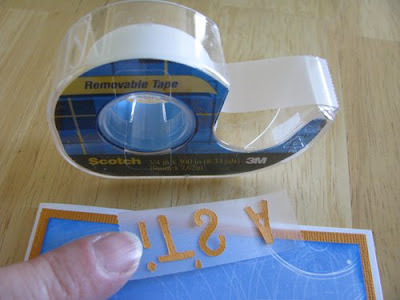 Today I'm going to show you a great tip on placing small letters on your cards or layouts. I used the new Quickutz Chicken Noodle Alphabet, it's great to have all the alphabet on one 4x4 die but trying to place these tiny letters can be challenging. I place my letters where I want them and then I take a piece of removable Scotch tape and place it over the first line of my letters. 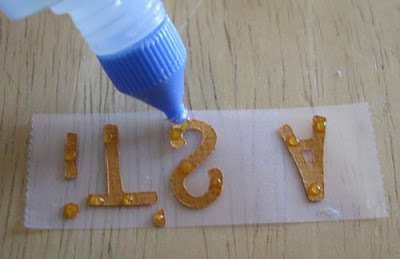 Once they're stuck to the tape I lift it off and put my glue in tiny dots on my letters. I then take the tape and place the letters where I want them and gently peel the tape away as I hold by letters down exactly where I want them. Then I do the next lines and Walla! The letters are all placed exactly where I want them! Because I'm frugal I save my tape strips and use them over again, I just stick the strip to something in my work area. 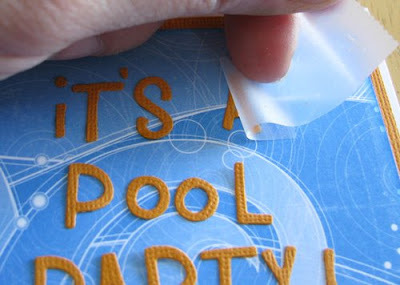 Ever since I learned this tip it has saved me lots of time and frustration with my diecut letters. 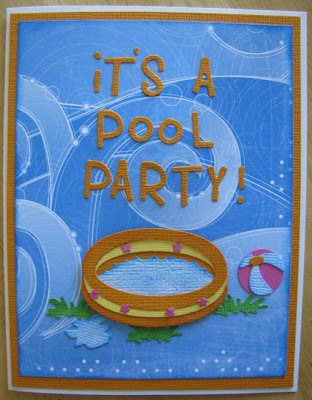 For my Pool Party invite I used the Quickutz Chicken Noodle 4x4 die, the CottageCutz Playpool and the grass off the CottageCutz Picnic Table die. It's officially summer and one of my favorite treats is ice cream. What's your favorite? I have several but Mint chocolate chip is one of my all time favorites so I had to make sure and add that flavor to my ice cream cone. 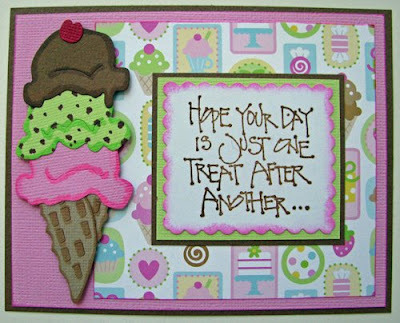 This CottageCutz Ice Cream Cones die is so versatile. It was almost as fun creating my diecut cone as eating a real one! There are two waffle cone variations and three different ice cream scoops to choose from. You can even add fudge sauce, sprinkles and a cherry! Think of all the possibilities with this fun die. I cut out my pieces and used Copic markers to outline the edges and add a little detail. You could use ink pads, chalk, Stickles, whatever strikes your fancy and these will sure to turn out yummy enough to want to eat. Be sure to check out all the June releases to help complete your summer cards and layouts. 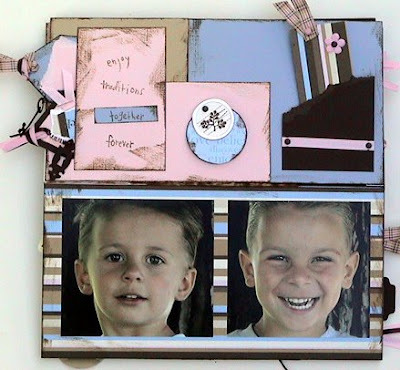 The July CottageCutz dies have been released and have special introductory prices till June 26th so don't wait! "If the shoe fits, buy one in every color." "If the shoe fits, it's expensive." "Is it time to go home yet? I keep clicking these *$%#*$ shoes and nothing happens." criticize them, you are a mile away from them and you have their shoes." "I'm a shoe fiend. That reminds me---I need to go shopping!" "Shopping tip: You can get shoes at the bowling alley for 85 cents." "Fashion Law: If the shoe fits, its ugly." God bless all the Fathers of the world. Please email Scrapping Cottage to select your free die from the June Quickutz release! Let us know what you picked!! 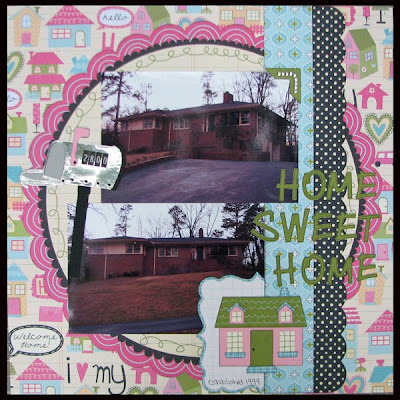 I been playing with another one of the new Rev House dies from the June QK release. I just love all the different styles of houses in this release. I can't wait to start combining parts from all the different houses! Don't forget that today is your last chance to post a comment in this thread for your chance to win a free die from this month's Quickutz release!! (Alphas/number sets not included). Hope you have a scrappy Saturday!! I have a dear friend at work who is retiring today!! Yippee!! Although we will miss him we are so very glad for him! shape sale going on right now at the Scrapping Cottage. Most 2x2 dies are $2.95 and most 4x4 dies are $4.95!! I think these new Home shapes from the June Quickutz release are so fun and practical!! 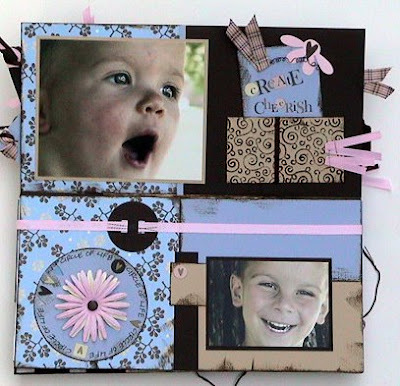 I have used one of the new Rev Houses and the Rev mailbox from the June release plus lots of other Quickutz dies on this layout. 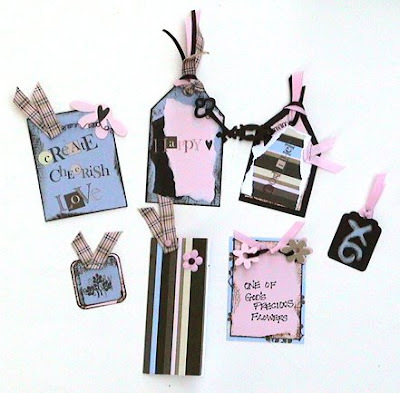 These house dies are so versatile that you can use any combination of colors and paper you want. 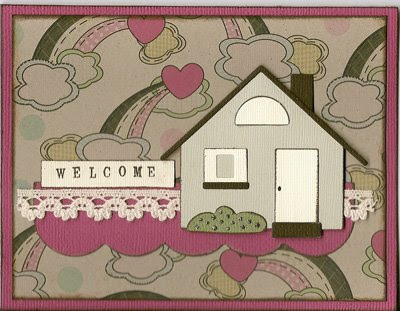 I even added a little doodling to my Rev house die cut to give it a whimsical look to go with the My Little Shoebox papers. I also used the Quickutz metal sheets to make my Rev Mailbox. I just love that whole line of adhesive sheets that Quickutz makes now!! Other Quickutz dies I used include Supermarket 4x8 Alpha, Cookie Cutter Nesting Labels, 12" Scalloped Border, and the 2x2 Photo corner. Run don't walk to check out the latest Cottage Cutz dies being released for July!!! They are absolutely adorable!! Lots of fun Hawaiian and other tropical shapes. I want them all!! :) We are also offering special pricing on these fabulous new dies until June 26th which is even more reason to pre-order yours today. We anticipate these will begin shipping mid-July. 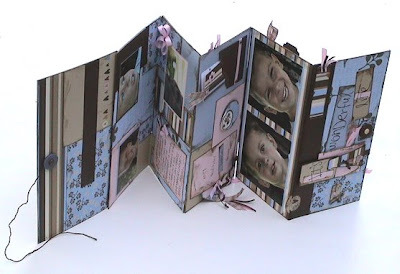 but this technique works wonderfully with cardstock, as well! it's tonal value! It is the most awesome ink ever! 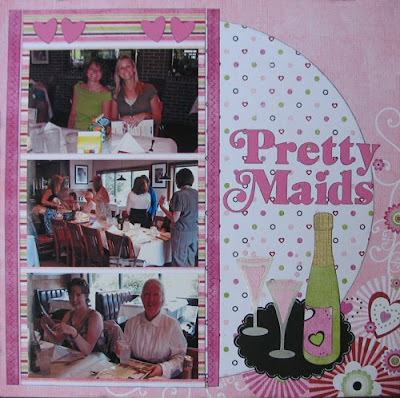 your amazing design to your layout or card! 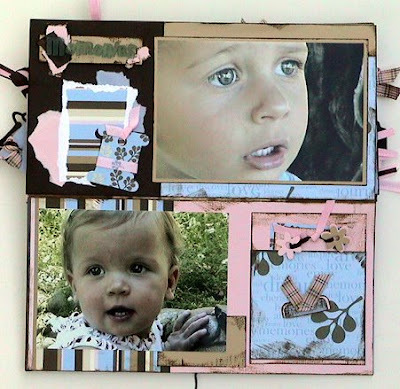 Distressing Ink, all of which can be used for projects like this! and the 2x2 sword if you would like to create a little pirate of your own! Who would have ever thought paper curtains could be so fun. When I saw this CottageCutz Window and Flower Pot die I immediately knew I wanted my curtains out of a bright and cheery patterned paper. 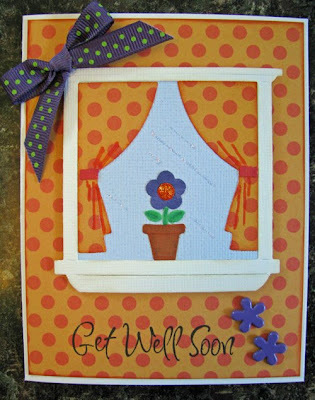 I thought this would make a good Get Well card and brighten someone's day. First I cut the die out of white cardstock and the orange patterned paper and inked the edges. Then I took my Copic markers and colored the flower and the pot and backed this all with a piece of light blue cardstock for the window. I used some tiny lines of Stickles on the window to make it look real. I added the brads after I assembled the card and didn't want the back of the brads showing through my card so I cut off the brad tabs and then used glue dots to secure them to my card. So when you're adding those fun new Quickutz to your cart don't forget to add a few CottageCutz dies too - they're so fun to work with. Here is a picture of what this die looks like. June Quickutz in the House!!! And the June Quickutz release is definitely all about the house and home! Soooooo many cute dies to choose from this month! Whether you want to make projects about the house itself or perhaps some whimsical pages about the goings on inside the house - this release is for you. But while you are shopping around for these fun new June release dies, be sure to add the Summer of Fun of dies into your cart as well. These have been wildly popular and are sure to sell out sooner rather than later so don't get caught without them! You definitely don't want to forget to add the FREE club die for all orders totally over $50! There are always a limited number of these dies and they go fast so don't delay your ordering too long! Be sure to make a comment at the end of this post to qualify for our monthly die giveaway!!! Just tell us which die (or dies - I know sometimes it is just impossible to pick one favorite) is your favorite from this current June release and you will be entered into our random drawing for a free die of your choice from the new June Quickutz Release (alphabets are excluded). I can't wait to see what everyone's favorites are this time around!! jewels as a young girl! the layout! Sometimes a little goes a long way! If you haven't picked up the Quickutz Cookie Cutter Nesting Stars yet, you are missing out! 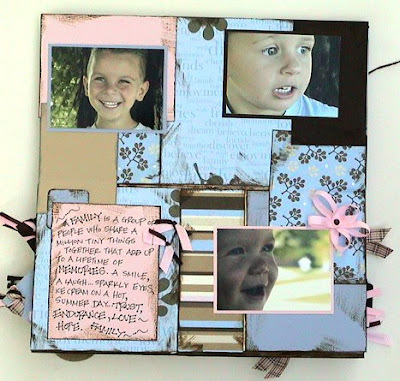 These star dies are such a nice chunky star shape and include 5 different sizes of stars. You can cut solid stars with these dies or layer them together to get star outlines. 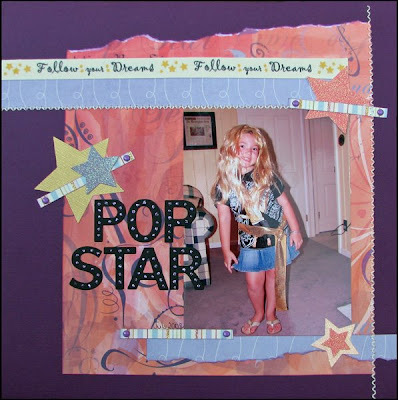 In my layout above, I used various sizes of the stars to accent my daughter dressed up like Hannah Montana, part time Pop Star. These dies would also look fantastic on 4th of July pages, Star Students, Super Sports Star, etc. For my title, I wanted the look of Spotlight, but I needed much smaller letters. 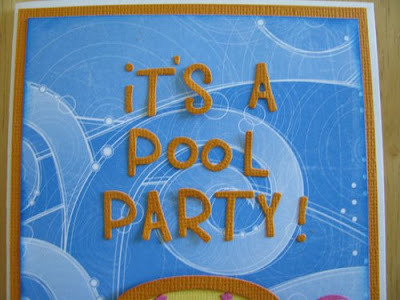 So I used the QK Merry Alpha from the 2007 Holiday Gift Set and added stickles to the letters for the effect I wanted. It is hard to see from the picture, but the stars are cut from glitter cardstock and are nice and glittery on the page. 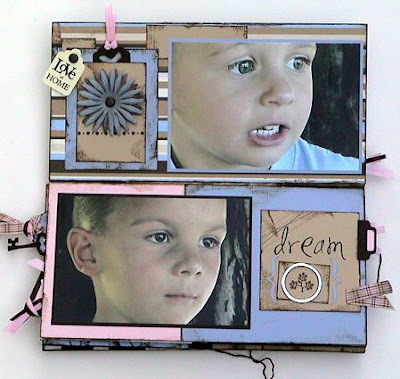 For this weeks Watch For It Wednesdays Post, I’m going to share a tip on RECYCLING WHILE SCRAPBOOKING. Whilst most of us are trying to watch our wallets and stick to a strict budget, we don’t want to or should have to put away our craft projects just because we are a bit short on $$$$$ to buy that perfect embellishment. When I did this layout of my son wearing his Favourite ‘Party’ outfit, I knew that he was never going to wear it again and Because I don’t want hundreds of my children’s old “Favourites” lying around the house long after the kids have outgrown them, I decided to make a true size colour photocopy of part of the outfit and use it in my layout. I then cut off the tags, labels, ribbons and buttons and attached them to the layout to give it a more textured 3 dimensional look. There you have it!!!! The perfect embellishments that also have a sentimental meaning and cost you nothing. Just imagine how many more CottageCutz & Quickutz dies you could buy from THE SCRAPPING COTTAGE if you don’t have to spend all your well deserved craft money on little embellishments that can be very costly. 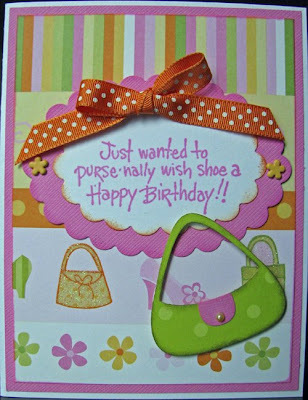 For this card I used the new Quickutz Scalloped Oval Cookie Cutter dies and one of the purses from the Spring Gift Set "flirt". The stamp is from Stampendous and is one of my favorites. I shaded around both scallops and the purse with my ink and a dauber and placed a little pearl on the purse. The new Champagne and Glasses Rev die from the May QK release is so fun!! For this layout, I wanted to try cutting the shapes out from patterned papers. I think it gives the Champagne bottle a fun and whimsical look. I used silver vellum for the champagne glasses and I made pink champagne to go inside :). I used my Chalk ink to lightly add a bit of detail onto the top of the champagne bottle to give it a little more of a wrapped look. 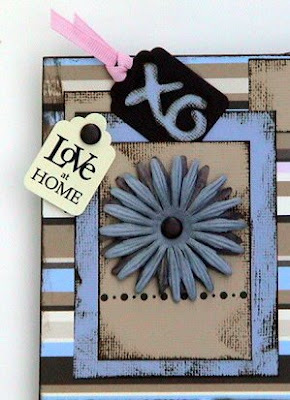 For this layout, I also used the QK Nesting Scalloped Ovals from this release and the QK Cookie Cutter Nutmeg Alphabet (on sale right now for only $59.99!!!) for the title. I love Nutmeg!! It is one of my favorite CC fonts. The little hearts above the pictures are from the Rev Love Birds Die. If you haven't checked out these new releases, don't wait too long! This week I decided to make a Wedding Card using the QUICKUTZ MAY RELEASE REVOLUTION WEDDING CAKE die REV-0201-S. I chose this gorgeous cake die because it reminded me so much of my own wedding cake and I wanted to decorate it very simular – although mine did not have mice on top. Mine had a gorgeous cluster of roses. I topped the cake with the mice from the QUICKUTZ EXCLUSIVE PRINCESS CARRIAGE DIE and used the bodies from the QUICKUTZ 2x2 BRIDE & GROOM DIE KS-0454. I inked the cake with TIM HOLTZ DISTRESS INKS and then made little flowers to decorate the cake using the little flower from the QUICKUTZ SWIMSUIT & HAT DIE KS-0569 and the tiny little leaves are from the QUICKUTZ TOPIARY DIE. In the centres of the flowers I have added little KAISERCRAFT RHINESTONES, which are so easy to attach because they are self adhesive and ready to stick. 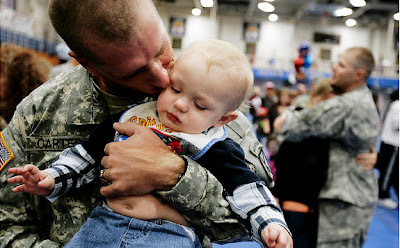 to know how precious they are and how much they are loved! I delicately sprinkled a few QuicKutz dies throughout, as well. on sale at The Scrapping Cottage for $2.95!! Yes, $2.95!! That is the best deal on the planet!! one that is $2.95! ), daisies and many more to suit your fancy! Summer of Fun is back!! !